This Mission chair complements the taller end chair and has a very solid design. 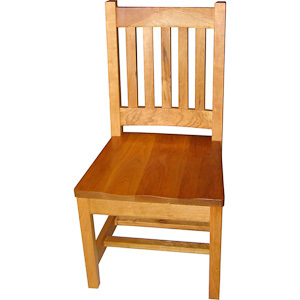 This chair shown here has five spindle back slats and a curve top and bottom support. The chair comes in either a curved or a straight back support. An example of the seat shown has a solid cherry seat. Optionally a fabic seat can be used. Please inquire about the fabric seat option. The chair can also come with arms. This chair also comes in a taller version.